For the past century, the pace and density of development near the ocean has been unprecedented, and much of it is incompatible with the dynamic nature of the shoreline. More than $3 trillion are invested in dwellings, resorts, infrastructure, and other real estate along the Atlantic and Gulf coasts of the United States, and more than 155 million people live in coastal counties. The coastal population is estimated to rise by 3,500 people per day. Yet, as the devastating hurricane season of 2004 showed, there is a price to be paid for living at sea level and building on sand. Even without extreme storms, the shoreline naturally advances and retreats on scales ranging from seconds to millennia. As a growing population hugs the coast, understanding the complex processes by which coastlines change has never been more relevant and more important to our well-being. Changes to the shoreline are inevitable and inescapable. Shoals and sandbars become islands and then sandbars again. Ice sheets grow and shrink, causing sea level to fall and rise as water moves from the oceans to the ice caps and back to the oceans. 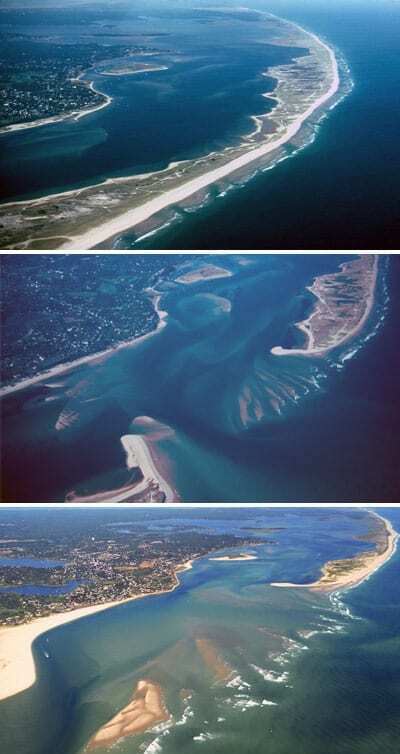 Barrier islands rise from the seafloor, are chopped by inlets, and retreat toward the mainland. Even the calmest of seas are constantly moving water, sand, and mud toward and away from the shore, and establishing new shorelines. Coastal changes have accelerated in the past century. Although sea level has been rising since the end of the last glaciation (nearly 11,000 years), the rate of sea-level rise has increased over the past 200 years as average temperatures have increased. Global warming has added water to the oceans by melting ice in the polar regions. But the greater contributor is thought to be thermal expansion of the oceans—a rise in sea level due to rising water temperature. Sea level has risen 10 to 25 centimeters in the past 100 years, and it is predicted to rise another 50 centimeters over the next century (with some estimates as high as 90 centimeters). Whether or not human activities have contributed to the change, the sea is definitely rising, and it jeopardizes our rapidly growing coastal communities. 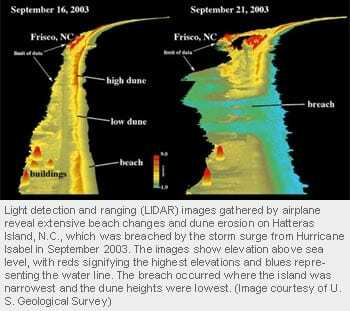 Coastal erosion accelerates as sea level rises. Erosion decreases the value of coastal properties because it decreases “the expected number of years away from the shoreline,” as researchers and underwriters put it. This quiet loss of U.S. property value amounts to $3 to $5 billion per year. Then there is the actual loss of property, including structures, which amounts to as much as $500 million a year. Eroding coastlines are also at greater risk from storm damage. Property damage from hurricanes along the eastern U.S. is estimated to average $5 billion per year, with the cost in 2004 alone estimated at more than $21 billion. Such calculations rarely account for the long-term costs of flooding and erosion, damage to natural landforms or ecosystems, and lost recreation and tourism opportunities. There is significant debate about how to best manage coastal resources to cope with the changing shoreline. When and where will the coast change? And what, if anything, should we do about it? Billions of tax dollars are being spent to restore and protect our wetlands, maintain our beaches and waterways, and rebuild coastal infrastructure. For example, the State of Louisiana is proposing to spend $14 billion over the next 40 years to restore coastal barriers along the Mississippi River delta. Despite these vast sums of money, very little is being invested in basic research that can improve our ability to predict shoreline change, inform managers in their decision-making, or provide more accurate risk assessment. The coast is an incredibly complex system, of which beaches are only one part. All aspects of the system—rivers, estuaries, dunes, marshes, beaches, headlands, the surf zone, and the seafloor—influence and respond to the others. But many parts of the system have yet to be studied in sufficient detail to fully understand their role in shoreline change. Beach erosion threatens property near the shoreline, but it also profoundly influences a critical part of our coastal ecosystem: the marshes. Tidal marshes in estuaries and behind barrier islands are the dominant habitat along the Atlantic Coast of the U.S., and they are particularly vulnerable to rising sea level. Marshes are ecologically and economically important because they regulate the exchange of water, nutrients, and waste between dry land and the open ocean. They filter and absorb nutrients and pollutants, and buffer coastlines from wave stress and erosion. And tidal marshes provide nursery grounds for countless species of fish and invertebrates. They are among the most biologically productive ecosystems in the world, producing more biomass per area than most other ecosystems. 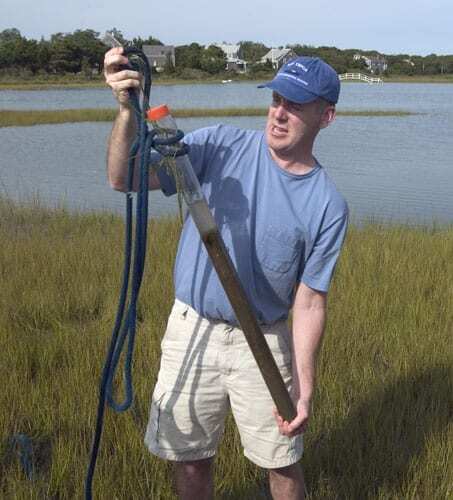 Whereas researchers have been studying the fertility and biologic productivity of marshes for many years, they have only recently started to determine how these coastal wetlands grow and erode. As sea level rises, we need to know the threshold at which marshes can no longer grow fast enough to keep pace with rising waters. If the rate of sea-level rise doubles over the next 100 years—or quadruples, as some more extr eme models project—tidal marshes and coastal ecosystems will likely experience unprecedented changes. Some may disappear altogether. Our coast may return to its condition at the end of the last glaciation, 11,000 years ago, when sea level was rising too fast for marshes to be established. Although there has been progress in many areas of coastal geology, our understanding of the fundamentals of shoreline change has been limited by the lack of a broad and integrated scientific focus and a lack of resources. In many locations, we cannot answer simple questions, such as where sand goes after it is eroded from the beaches, or what role underwater formations play in determining which areas of the coast will erode and accrete. Recent advances in technology make this an ideal time to tackle some of these science problems. Our ability to map, measure, model, and understand the fundamental processes shaping the shoreline has never been better. We can gather a more precise record of long-term trends in shoreline motion, which were previously identifiable only through historical records, such as by comparing old nautical charts with modern ones. Several instruments have allowed us to make dramatic improvements in our ability to map the beach and seafloor, and what lies beneath. Light detection and ranging (LIDAR) allows researchers to use radar-like pulses of light to map beaches and the bottom of clear, shallow waters. It provides maps that are precise to within 10 centimeters. Global Positioning System receivers and monuments use satellites to track the movement of shoreline features from day to day in three dimensions. These devices allow positions to be obtained accurately within a few centimeters. High-resolution seismic imaging, ground-penetrating radar, and electromagnetic resistivity instruments employ sound and electrical signals and the properties of rocks and sediments to “see” the layers beneath the beach surface and seafloor. They can probe to depths of tens of meters. The processes that shape our coasts occur on a variety of time and space scales. Linking these diverse processes is a challenge that requires a system-wide, multidisciplinary approach. It also requires the willingness of policymakers and coastal managers to support basic research and to pay more attention to its results. There are several clear, process-based science problems that need to be addressed before we can accurately predict shoreline change. How is the shoreline changing with time and geography? Many studies of nearshore processes have been conducted on long, straight shorelines, and scientists have made some progress in understanding how waves, sandbars, and currents interact in simplified situations. But the mechanisms driving shoreline change are not well understood in regions where the nearshore region has complicated seafloor topography, inlets, or headlands—which means most beaches. 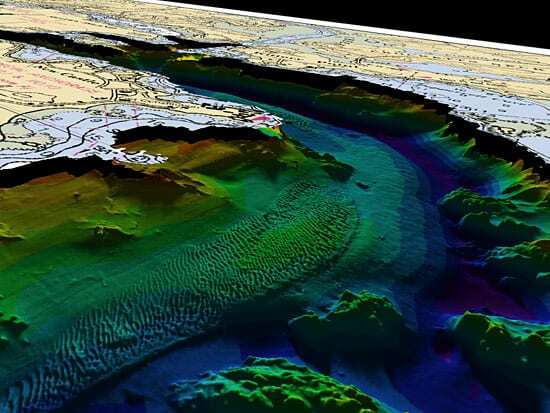 Waves traveling across the continental shelf are reflected, refracted, amplified, and scattered by underwater topography, and research has suggested that erosional hotspots along the coast are often the result of these seafloor formations. Banks, shoals, canyons, and even different types of sediment cause waves to decay and break differently. Wave-induced currents cause sediments to erode and accrete and reshape the seafloor near the coast, changing how future waves will evolve. The complex dynamics betweenwaves and seafloor evolution need to be unraveled before we can make predictions about changes to the shoreline. 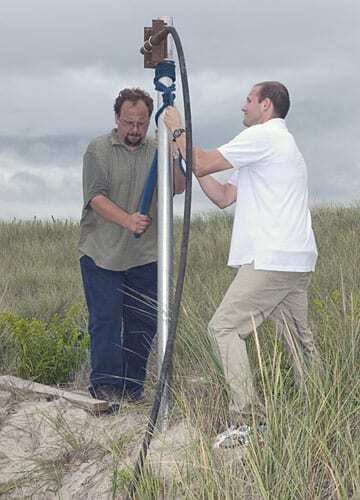 We need to build a network of wave-measuring instruments along different coastlines and feed those measurements into computer models of how the shoreline reacts to waves and currents. These models will help us make predictions about how water might circulate and how sediment might move in response to those different underwater formations. How will barrier islands respond to sea level rise? 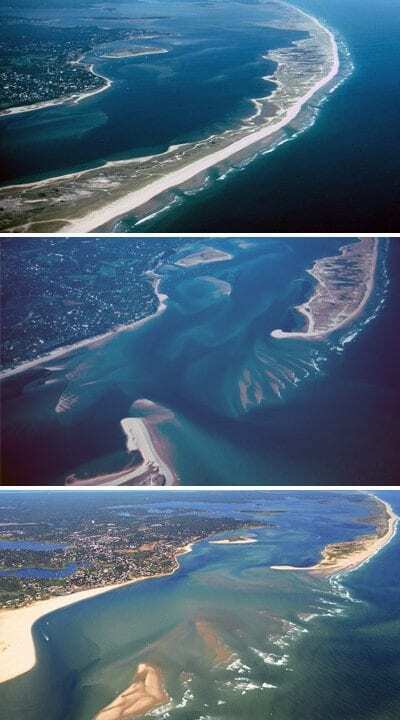 Barrier islands account for approximately 15 percent of the world’s shoreline, and they dominate the Atlantic and Gulf coasts of the United States. Built by the action of waves and currents, these narrow ridges of sand usually run parallel to the mainland, protecting the coast from erosion. 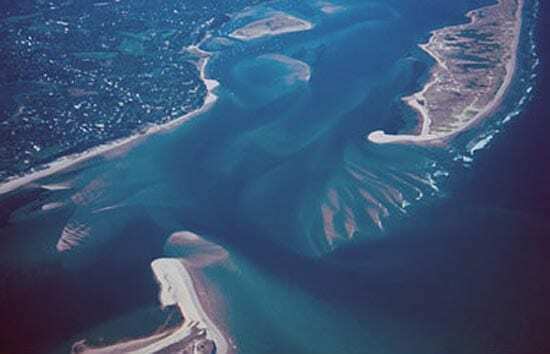 These natural barriers are bisected by tidal inlets and channels, and they shelter back-barrier salt marshes, tidal flats and deltas, and mangroves. Though usually no more than a few meters above sea level, these islands are often covered with human developments. The long-term fate of today’s barrier islands is dependent on future sea-level rise. The latest report of the Intergovernmental Panel on Climate Change predicts that global warming will cause sea level to rise by 50 to 90 centimeters in the next 100 years. At the higher end of these estimates, many back-barrier marshes will struggle to keep up with the inundation. Sand will move from barrier beaches to the nearshore underwater regions in order to re-establish equilibrium between the slope of the beach and the higher tides and waves. The water levels and topography behind these barriers could gradually or catastrophically change. Inlets will become more dynamic, while deltas will enlarge. Whole marshlands might disappear, being converted to tidal lagoons or bays. Catastrophic amounts of sand could be lost from some beaches. To properly protect barrier beaches—or learn when to abandon them—we need to map and monitor them regularly. We also need to dig into the sediments of the coast to piece together the history of past changes. 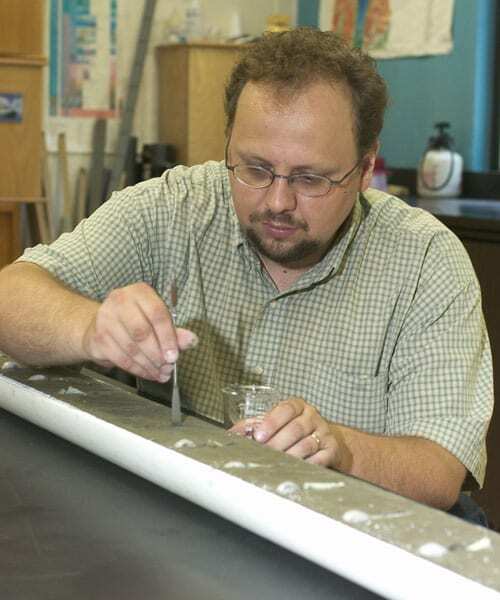 Such efforts will allow us to model how tidal systems are likely to respond to rising ocean waters. What is the impact of storms? Intense storms such as hurricanes, nor’easters, and typhoons often result in substantial loss of life and resources, yet we know little about the processes that govern their formation, intensity, and movement. Nor do we know much about their history, due to the relatively short history of reliable weather observations. With little data on how coastal systems have responded to storms in the past, we have been ill-equipped to model and project how climate and sea-level change will affect future storm trends. Geological investigations of coastal environments can provide long-term records of environmental change. Evidence of past storms can be found in back-barrier sediments: When a storm washes sand over the dunes and into back bays and marshes, it forms dateable layers in the muddy sediments. Mapping regional occurrences of these “overwash” deposits can allow researchers to estimate the storminess of years past and help improve models of the probability of future storm strikes. How is the shore linked to the shelf? In the past, studies of the beach and surf zone were usually separated and studied independently from what was happening further out on the continental shelf. 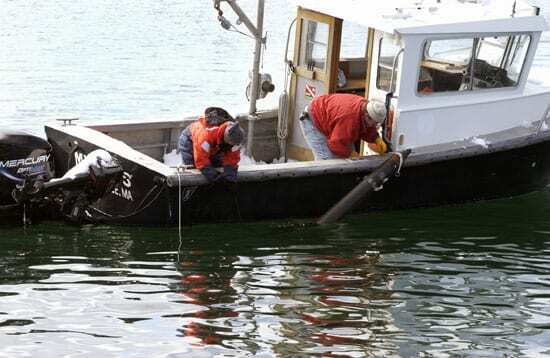 It has largely been a logistical problem, as the region from 0 to 10 meters of water depth can present some of the most difficult areas to sample. These areas are too shallow for most ships, and too deep or turbulent for researchers on foot. However, the zone from 10 meters above sea level to 10 meters below is perhaps the most physically dynamic and ecologically vulnerable. If we are to fully understand the coastal system, we have to eliminate the imaginary barrier between the shallows and the deep. What can the past tell us about the future of the shoreline? Natural records from a variety of sources—deep-sea sediments, ice sheets, corals, calcium carbonate formations in caves—show that abrupt environmental changes are common in Earth’s history. Sea level rise rates during the past 11,000 years have been uncharacteristically steady, and may be ripe for change. That our coastlines have developed such remarkable diversity during these stable times (environmental stress usually promotes diversity; calm promotes homogeneity) suggests the shape of the shore is affected by a lot more than sea level. Coasts are complex, transitional environments that respond to changes in both continental and deep ocean processes. The sediments on- and offshore are great recorders of this variability, yet these archives have yet to be systematically studied and compared with what we have learned from inland and deep-sea environmental proxies for climate. Resource managers and civic leaders have a great responsibility for managing the coast and human use of it, but they have not always had the best information available to make scientifically sound decisions. The link between sea-level rise and shoreline change, while undoubtedly present, remains controversial. For this reason, coastal managers want more reliable data on sea-level rise. They need studies that apply our knowledge of basic processes to more complex, human-altered shorelines (seawalls, bulkheads, jetties, groins). They need scientific analyses of the effects of adding and removing sediments from the shoreline. There is no doubt that sea level is rising. It’s not the first time, and the rate at which it is changing may or may not be unusual. What is different this time is that humans have congregated along the shoreline without much awareness of how much or how soon the sands might shift. We have the ability to make better decisions about our lives along the coast. We just have to start making the measurements that can provide the right answers. Roughly 1,500 homes are lost to erosion each year. contributor to gross domestic product. out of every four of those structures will be destroyed.